February is a month for celebrating love and Valentine’s Day. I will also be celebrating my wedding anniversary with John on the 9th. We were talking last night about how nice it would be to go back to St. Lucia where we honeymooned. Such a nice little island to visit. Those little get-away trips are important to us. We love our kids, but we NEED “our time” occasionally. I wanted to make a vintage-ish lovey card with masculine bright colors. This card can actually be for anyone special, but it’s appropriate for an anniversary card. The cardfront sentiments and pull out tag with written words reinforces that I’m always here for him 24-7. 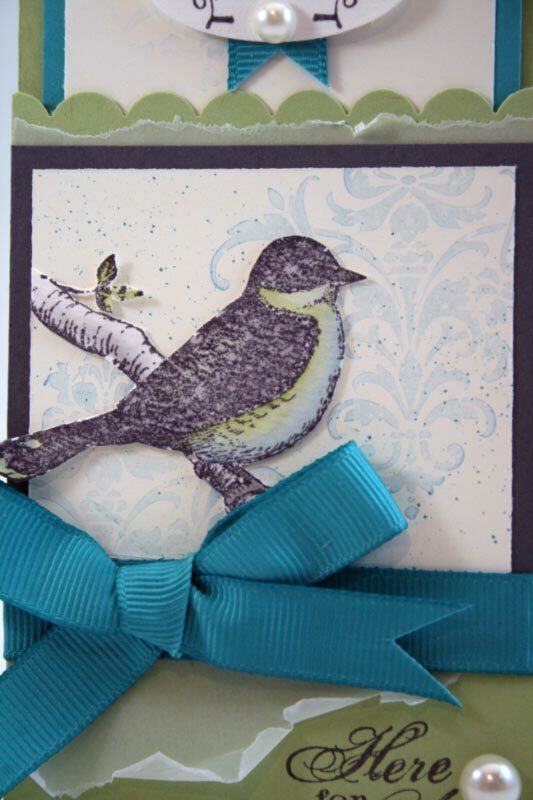 The bird image was stamped on Watercolor paper, colored with inks using an Aqua Painter, and cut out. Added some vellum and Pretties Kit pearls here and there. Below is an upclose to show those details. PAPERS: Watercolor Paper; Vellum; Very Vanilla, Certainly Celery, Bashful Blue, Bermuda Bay, and Basic Gray cardstock. INKS: Basic Gray, Certainly Celery, and Bashful Blue Classic Stampin’ Pads. 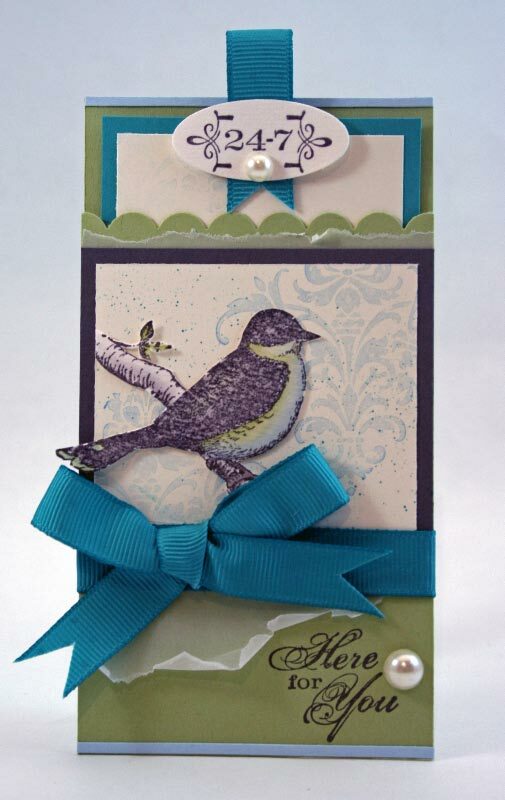 ACCESSORIES: Pretties Kit; Aqua Painter; Spritzer Tool; Stampin’ Dimensionals; Small Oval Punch; Scallop Edge Punch; Bermuda Bay 1/2″ Polka Dot Grosgrain Ribbon. Beautiful!! I love this stamp set!!! Thanks for sharing! I love tag cards but I never know really how I can use one! I LOVE the color combinations and the use of vellum!